The steppe bison had much larger horns than modern bison. 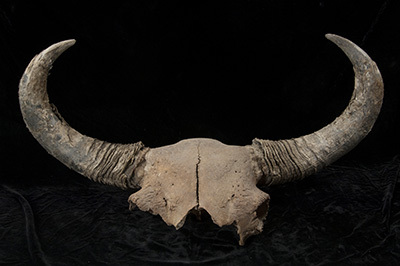 Radiocarbon dating and DNA analysis of bison fossils enabled researchers to track the migration of Pleistocene steppe bison into an ice-free corridor that opened along the Rocky Mountains about 13,000 years ago. 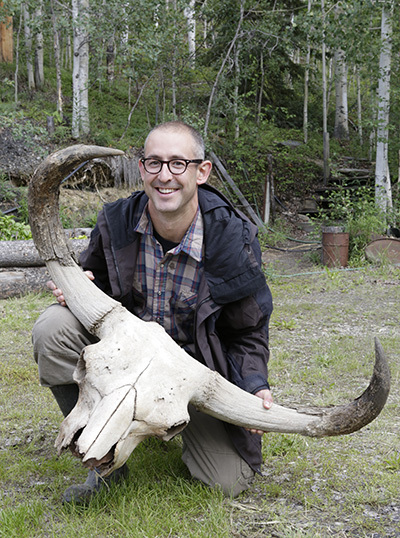 Grant Zazula of the Yukon Paleontology Program with the skull of a Pleistocene steppe bison. The researchers combined radiocarbon dating and DNA analysis to track the movements of bison into the corridor, showing that it was fully open by about 13,000 years ago. Their findings, published June 6 in Proceedings of the National Academy of Sciences, indicate that the corridor could not account for the initial dispersal of humans south of the ice sheets, but could have been used for later movements of people and animals, both northward and southward. In the 1970s, geological studies suggested that the corridor might have been the pathway for the first movement of humans southward from Alaska to colonize the rest of the Americas. More recent evidence, however, indicated that the Cordilleran and Laurentide ice sheets coalesced at the height of the last ice age, around 21,000 years ago, closing the corridor much earlier than any evidence of humans south of the ice sheets. "The opening of the corridor provided new opportunities for migration and the exchange of ideas between people living north and south of the ice sheets," said first author Peter Heintzman, a postdoctoral researcher at UC Santa Cruz who led the DNA analysis. 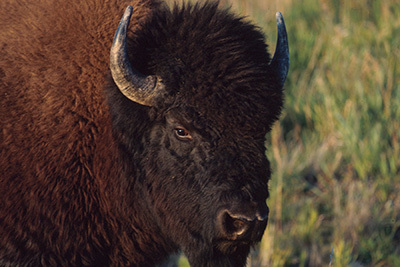 Previous work by coauthor Beth Shapiro, professor of ecology and evolutionary biology at UC Santa Cruz, had shown that the bison populations north and south of the ice sheets were genetically distinct by the time the corridor opened. By analyzing bison fossils from within the corridor region, the researchers were able track the movement of northern bison southward into the corridor and southern bison northward. "The radiocarbon dates told us how old the fossils were, but the key thing was the genetic analysis, because that told us when bison from the northern and southern populations were able to meet within the corridor," Heintzman said. "Bison fossils are the most widespread Quaternary mammal in western North America and of interest because they survived the extinctions at the end of the Pleistocene, unlike most other North American large mammals," said coauthor Duane Froese of the University of Alberta. "We were able to sample bison fossils, largely from museum collections, including critical ones from central Alberta that dated to the initial opening of the corridor." According to Shapiro, archeological evidence suggests that human migration within the corridor was mostly from south to north. Sites associated with the Clovis hunting culture and its distinctive fluted point technology were widespread south of the corridor around 13,000 years ago and decline in abundance from south to north within the corridor region. A Clovis site in Alaska has been dated to no earlier than 12,400 years ago. "When the corridor opened, people were already living south of there. And because those people were bison hunters, we can assume they would have followed the bison as they moved north into the corridor," Shapiro said. The steppe bison of the Pleistocene (Bison priscus) were much bigger than modern bison (Bison bison), she said. Before the corridor closed, prior to the last glacial maximum, they moved freely up and down between the ice-free regions in the north and grasslands south of the ice sheets. After the ice sheets coalesced, the population that was cut off to the south contracted, leaving one genetically distinct southern lineage. The DNA analysis used in this study focused on mitochondrial DNA, which is easier to recover from fossils than the DNA in chromosomes, because each cell has thousands of copies of the relatively short mitochondrial DNA sequence. While Shapiro's lab led the DNA analyses, Froese's lab led the radiocarbon dating work. Many of the fossils they analyzed came from collections at the Royal Alberta Museum in Edmonton and other institutions. "Thousands of steppe bison fossils are recovered in northern Canada every year," said coauthor Grant Zazula of the Government of Yukon Palaeontology Program in Whitehorse. "Most of these fossils are uncovered by mining or gravel pit operators and later made available to scientists for study. These results speak to the importance of collecting and preserving fossils in order to better understand our history." The research team included coauthors from UC Santa Cruz, the Government of Yukon paleontology and archaeology programs, Pennsylvania State University, Prince of Wales Northern Heritage Center, Simon Fraser University, Royal Alberta Museum, UC Irvine, and UCLA. This research was supported by the U.S. National Science Foundation, Gordon and Betty Moore Foundation, Canada Research Chairs program, and the Natural Science and Engineering Research Council of Canada.